04 Montreal Nintendo Orkestar – I’ll Meet you in the caves of Thulsa Doom, baby! Once again we meet under the widening umbrella of the label [walnut + Locust], in a gathering of three musical projects. Those who heard the previous albums in this series have probably noticed how each time the three artists communicate with each other and keep a specific musical line together, and this album is no different. 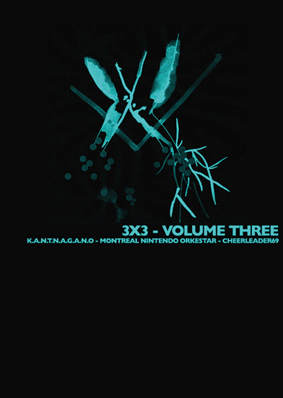 The three parts of this third “3X3”, played by K.A.N.T.N.A.G.A.N.O, The Montreal Nintendo Orkestar and Cheerleader69 (whom you might also know from the band “Punish yourself”), are forming together eight pieces of abstract, even quirky, story. Nevertheless, and needless to say, it is easy to distinguish and understand the differences between the three projects, as each one brings, apart for the main album theme, an interesting musical personality. We begin with K.A.N.T.A.G.A.N.O, who brings one long track for this album. Opening with a dreamy part that gradually becomes intense and melancholic, “H.E.R.A.C.L.I.T.O.R.I.S” becomes a heavy, slow and dramatic entity, with different electronic events circling it as if it was a dying sun. At its apex you can appreciate how the electronic pulses became so emotional and grasping, and then, and just then, this track dies in order to give way to the Montreal Nintendo Orkestar. MNO opens with a series of droning feedbacks, taking it from the heavy battlefield that was left by their predecessors. Metallic gongs and singing bowls are setting some kind of a ceremonial costume over the ominous atmosphere, which develops over the next MNO tracks. This portion of the album, although reminding a little the first track for the various electronic beats and bits, sounds more enigmatic and makes me think about underground temples more than anything else. Last, but certainly not least, is Cheerleader 69 with two tracks that are actually four parts of one musical piece. A crawling introduction gives way to pulsating trip through emotional, and even intimate, music. With this eerie and hypnotic gesture, Iokanaan drifts and molds itself into a third shape, more menacing this time. Cheerleader69 slows down with the beats for a short while, only to emerge once again with a darker tone. Three faces are presented on this album, and while they do share similar characteristics and ideas, the three of them are coming from different places and looking at different directions. [walnut + locust] knows how to make sense of this composition and the result is an impressive album!